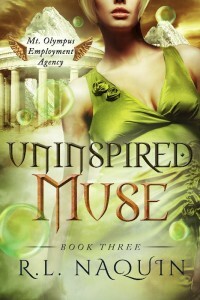 Bottle Cap Publishing is pleased to reveal the cover of Uninspired Muse, the third (and final) book in R.L. Naquin’s Muse series. This cover—as well as the covers for Unfinished Muse and Unamused Muse—was designed by Clarissa at Yocla Designs. Uninspired Muse is coming this spring from Bottle Cap Publishing. It will be available in ebook and print format. If you haven’t already picked up the first two books in the Muse series, pick up Unfinished Muse and Unamused Muse to find out how Wynter’s adventures began.